Apricots resemble the Japanese apricot or ume. However, ripe apricots are much sweeter. In Japan, they are produced in the Aomori and Nagano prefecture during the summer months. Apricot can be used to make jam, juice, and many other foods with apricot. It is particularly high in vitamin E content. 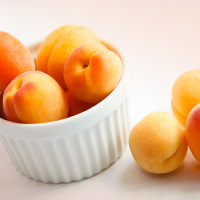 The calories in Apricots per 66g(1item edible part) is 24 calories. Apricots is calculated to be 36Cal per 100 grams making 80Cal equivalent to 222.22g with 5.61g of mostly carbohydrates、0.66g of protein、0.2g of fat in 66g while being rich in vitamins and minerals such as Vitamin E Alpha Tocopherol and Vitamin A Retinol Equivalent.